Two summer jellies: blackcurrant and rose; lemon grass and ginger. Divide the blackberries between 6 small glasses. 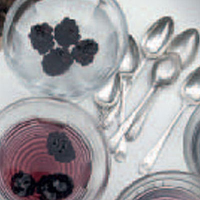 For the blackcurrant and rose water jelly, soak the gelatine leaves in a bowl of cold tap water for 5 minutes. Heat 200ml sparkling water to about blood temperature; pour it into a large jug. Lift the gelatine from its water, gently squeezing out any excess liquid. Stir it into the warm water with the sugar, until dissolved. Add the remaining ingredients, then divide the mixture between 3 of the small glasses. Follow exactly the same method for the lemon grass and ginger jelly. Chill the jellies in the fridge for at least an hour, to set. Above per blackcurrant jelly. Per lemon grass jelly: 62kcal, 0g fat, 0g saturated fat, trace salt, 15.5g sugars.